Sometimes you just want to get away from it all, and that’s the perfect time to plan a trip through Hampshire County, WV, where time stands still. From relaxed wandering down two-lane roads, to pulling up a chair on a porch to listen to bluegrass music, to attending a traditional flag-raising ceremony or hiking scenic overlooks, there’s nowhere you have to be and no clocks you need to watch—unless you want to catch the Potomac Eagle for a three-hour train ride through the bucolic countryside. As the gateway to the Potomac Highlands, this rural area has a lot to offer those wanting to get away from it all—and by it all, I mean staying in accommodations where there’s no TV or Internet in the rooms. This had me a little freaked out at first—after all, as a journalist, I am never unconnected, so it was pretty strange to realize that I could actually function without using my phone as an extra appendage. I spent the night at the Capon Springs Resort, which reminded me so much of the Catskills cabins in the movie Dirty Dancing that I expected Patrick Swayze to sweep me away at any moment. Driving down a dirt mountain road, you’d never expect to come upon this unique property, especially as there aren’t even any signs to direct you to its location. But when you come around the last bend and see its stately white gabled buildings, pristine nine-hole golf course, and cheery fountain spewing the famed Capon Springs water, it’s hard to believe that this Shangri-La is located in a West Virginia hollow. The 115-room resort, now in its 85th year, is a “best-kept secret” by the many guests who have come to visit for generations. Part sleepover camp and part old-fashioned family getaway, people reserve their rooms for the next year before this year’s visit is even over—maybe it’s the all-you-can-eat steak night or the fact that you can play fling golf or hickory golf on a course that doesn’t require tee times. It might be because every staff member makes a point of greeting you personally, though my guess is that it’s the amazing water that makes the visit worthwhile—once touted as a homeopathic remedy, this pure spring-fed water—which comes out of your sink, shower and even the fountain out front—is said to cure a multitude of ailments. Of course, you’re not truly appreciating Hampshire County if you’re not taking advantage of its arts scene—and that includes amazing bluegrass music. I enjoyed a couple of impromptu concerts; one in the dining area of the resort, and another at North River Mills, where players jammed on mandolins and even homemade instruments at the Miller House while swapping stories in between sets. One of the players was a guy who just happened to be traveling through the area with his wife; hearing about the jam, he showed up and got to play with some really talented musicians. Talk about making a vacation memory! The arts are such a big part of the area that The River House, a café in Capon Bridge, was actually opened to support local creativity. In addition to serving amazing food, some of which is created by the owner of The Farmer’s Daughter, a butcher who also happens to be the owner’s son-in-law, the café was designed as a healing and transformative space that provides arts education, support and exposure. A kickstarter to renovate what was once a funeral home raised $23,000 to restore the old building; now all of the café’s sales go toward funding arts programs. A walking tour of the town of Romney also provides a great opportunity to see gorgeous paintings, carvings and more at The Hampshire County Artists Co-op and Heritage Market Place, which features the works of numerous local artists. While the town isn’t big, it has a unique charm of its own—make sure to stop into Anderson’s Corner to visit Patty, who, when she is not selling you one-of-a-kind jewelry, is providing wine tastings in the back room. The town is also famous for being a key piece of property during the Civil War—it changed hands no less than 56 times during the conflict, and you should definitely stop by the Davis House downtown to get an insider’s look at what it was like to be a Confederate supporter during that time. I would be remiss if I didn’t talk about the scenery, because this is a gorgeous part of the state. 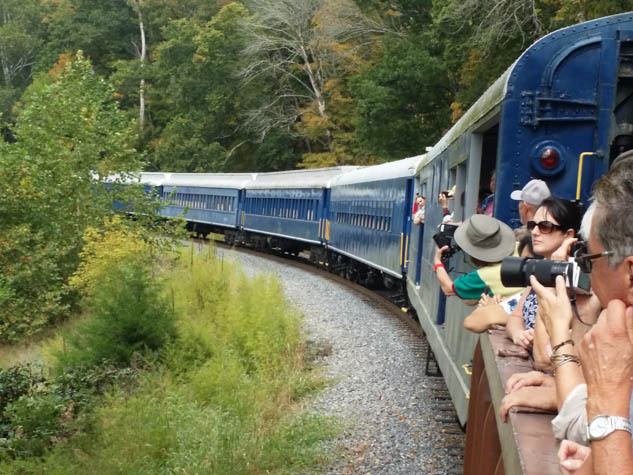 One of the best ways to appreciate the southern panhandle of West Virginia is to take the Potomac Eagle train ride through the Trough—it’s a little surprising to find yourself sandwiched between the beautiful South Branch of the Potomac River and the imposing face of Eagle Rock, but the views are well worth it. I highly suggest that you spend some time on the gondola car, which is open to the outside and offers the most amazing look at the area up-close. The fact is, I didn’t even miss my phone during the time I was traveling in Hampshire County. And in this day and age, that’s saying a lot. Where do you go to get disconnected? Tell us about it on Facebook.